Flashlights are so 20th Century. Be it the incandescent type that popped up very early on, or LED models with came around in the 90’s, there’s not much excitement to the devices. But [Sriranjan Rasakatla] is doing his best to change that. 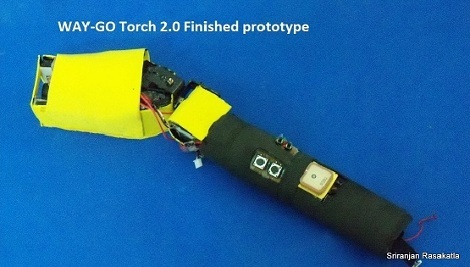 This is his WAY-GO Torch, an intelligent flashlight (a Smart Light?) that will not just light your path, but overlay useful data on it. At the front of the unit a pico projector is housed on a jointed assembly. This allows the device to project data on the ground in front of you. Using a digital compass and GPS module, it can show the polar coordinates, guide you on your way, or provide information about the buildings around you. The motorized mount provides image stabilization based on IMU data. Check out the demonstration video after the break. It shows general functionality in the first part of the clip, with some footage of the stabilization system at about 4:30. This really does seem like it came right out of a Sci-Fi novel. It’s useful, but the complexity makes it surprising that [Sriranjan] was able to pull it off. We wonder how the battery life is on the device, but it can’t be any worse that one of those really huge flashlight builds. It’s a fun time to design your own MP3 player, lovingly adding in features to a meticulously crafted user interface. But sometimes you just want a quick and cheap way to add music to a project. [Jeff Ledger] will show you how to do just that using some knock-off hardware from overseas. 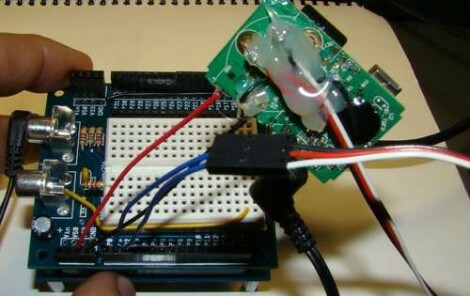 Instead of a proper breakout board — which can cost a bundle — he used a generic MP3 player acquired for $3 from an eBay seller. Cracking open the case you’ll see that you actually get a lot for your triad of Washingtons. We know, it may be of questionable quality (see this feature about cheap PSU problems) but we’re not building mission critical hardware now are we? Inside is a rechargeable Lithium battery for use with another project, and a chip-on-board device with attached SD card slot, audio jack, and USB port. The battery inputs are used to solder the MP3 pcb to the power rails on your project. To control the playback, just make connections to the button pads as [Jeff] describes in his post. It sounds like this will work with any MP3 player which runs at either 3.3V or 5V. 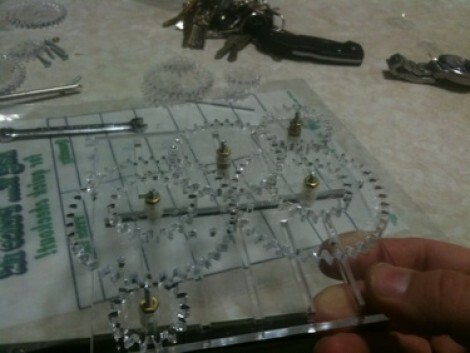 [Alex] got his hands on an Epiloge laser cutter the easy way — the company he works for bought one. We’re sure he’s not trying to rub it in, but he really does make the tool look and sound cool in the post he wrote purely to show off the new toy hardware. This model is a CO2 laser and it’s capable of etching and cutting a variety of materials. It does so with a 1200 DPI resolution at 0.005 pitch. The samples of engraved text and images show the clean lines and shapes this type of accuracy can achieve. The most stunning example is a piece of anodized aluminum which ends up showing some fantastic contrast that would make perfect face plates for project enclosures. Then there’s the cutting feature which is responsible for the gear demo seen above. We were surprised to hear that it will cut through acrylic but not polycarbonate. After the break we’ve embedded [Alex’s] video. The camera is focused on the cutter as it engraves some lettering, then cuts out a gear. During the process he discusses what he’s learned about the device, sharing some interesting tidbits along the way. We’re hoping to see some cool stuff like this from [Grenadier] who recently won a similar 40 Watt CO2 laser from Full Spectrum. Nothing stinks up the house like a sink full of dirty dish. Well, a full trash can will do it to a greater extent, but that’s a project for another day. In what must be an overreaction to a perpetually full sink of dishes at his London Hackerspace, [Tom] built a web-connected dirty dish detector. He calls it the Great OpenCV Wash-Up Detector. The system features a series of different signals to ‘remind’ forgetful geeks about cleaning up after themselves. The initial implementation uses a traffic signal to alert the room that there are dirty dished to be cleaned; illuminating the different colors to show how long the sink has been full. [Tom] also plans to add message bursts to the IRC room, and air horns when the situation gets dire. 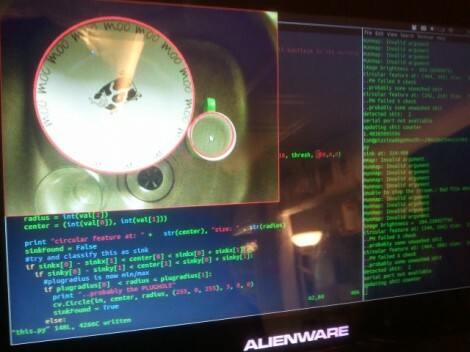 As the name implies, this uses OpenCV to detect circles in the sink. A webcam has been mounted above it pointing straight down, providing a clear input image to detect plates, mugs, and the like. [Tom] even wrote some code that disables the system when the lights are turned off. Of course, this may train offenders to leave the dishes on the counter where the detector can’t see them.